Unlike other media, in which rules are established by legislation, self-regulation or the owner of the communication channel, on the Internet, there are no set of rules. In fact, there is no one to established them. There is actually a constant battle between total freedom on the Internet and the governments and institutions that seek for means to regulate its use. But the reality is that the Internet is a communication vehicle without established property, with pulverized responsibilities between millions of connected suppliers, and distributed geographically all across the planet makes it nearly impossible to initiate any regulation attempt. Rules are created by the experience of Internet users themselves, and generally, rules are informal, not written. The experience allows us to identify some of those tules, and the successful and failed cases in online initiatives help us to confirm what work and what doesn’t. In the case of social networks and online gaming, the own apps created internal rules that are followed by the users. However, even if those rules are not visible to the beginners, the experience of usage and interaction is responsible for the user’s training. But even with standards created by websites, apps and social networks in constant transformation, propelled by the learning of good and bad use of those platforms. 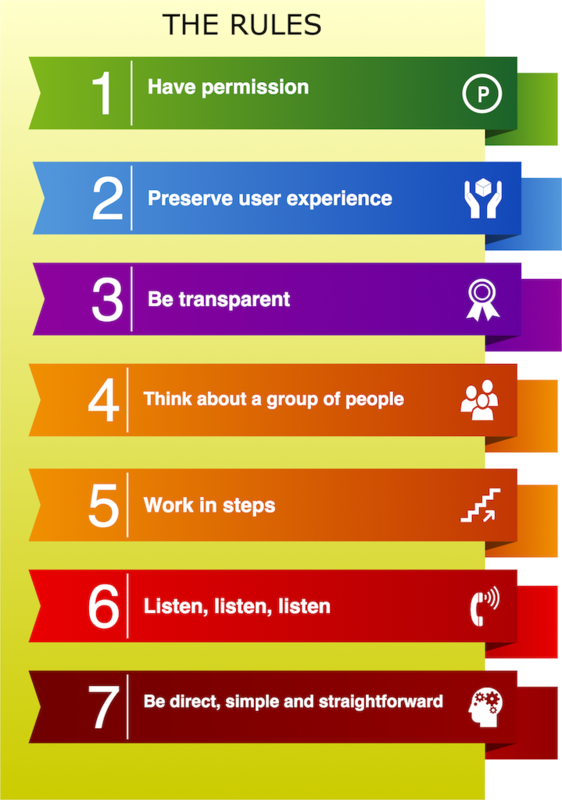 ■ Preserve the user experience. ■ Think about a group of people. ■ Be direct, simple and straightforward. These seven basic rules are the ones that help to keep your digital marketing actions and campaign under control, avoiding the basic online communication mistakes to damage your work or your brand. Let’s explore with more detail every single rule so you can use them as the base of any digital marketing interaction.